The Common Carotid artery is a large elastic artery which provides the main blood supply to the head and neck. There is one common carotid artery on either sides of the body (Right and Left carotid arteries). They supply the head and neck with oxygenated blood and they divide in the neck to form the external and internal carotid arteries. Although the right and left carotid arteries follow the same course through the neck, their origins differ, where the left common carotid arises directly from the branch of the aortic arch whereas on the right, the origin is from the brach of the brachiocephalic trunk. 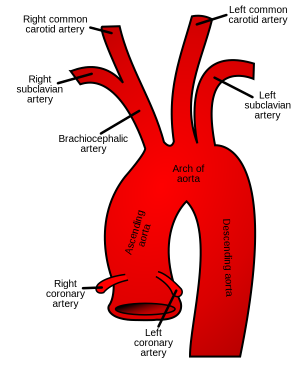 Whilst these arteries originate from different arteries, they follow symmetrical courses. Posterior to sternoclavicular joint and lateral to thyroid and trachea. The arteries split into the external and internal carotid arteries at the upper border of the thyroid cartilage, at around the level of the fourth cervical vertebra. The external carotid artery supplies blood to the face and neck. It mainly gives supply to the head and neck. The common carotid artery is frequently used in measuring a persons pulse, especially in those patients who are in shock and lack a detectable pulse in the more peripheral arteries of the body. The pulse is taken by palpating the artery just deep to the anterior border of the sternocleidomastoid muscle at the level of the superior border of the thyroid cartilage. The presence of a carotid pulse has been estimated to indicate a systolic blood pressure of more than 40 mmHg, as given by the 50% percentile. It is a narrowing of the carotid arteries caused by a buildup plaque (atherosclerosis) inside the artery wall that reduces blood flow to the brain which my cause a stroke. Carotid sinus hypersensitivity is an increased response to carotid sinus stimulation, which can occur with advanced age, coronary artery disease or hypertension. External pressure on the carotid sinus can cause bradycardia and hypotension, which can lead to dizziness or syncope. Therefore, palpation of the carotid pulse is not recommended in patients with this condition. A weak area of the carotid artery allows part of the artery to bulge out like a balloon with each heartbeat. Aneurysms pose a risk for breaking, which could result in stroke or severe bleeding, or hemorrhage. Inflammation of the carotid artery, due to an autoimmune condition or an infection.